Showing God's love is an important part of being a follower of Jesus. Here at Pathway we want to give you plenty of opportunities to practice showing love to others within our family, in our community, and beyond. If you have a desire to serve in a way or a place not listed here, let us know. Support a Pathway outreach project or a person going on a Pathway outreach project. If your gift is different than the amounts listed, you can add varying amounts of each price to get your total (ie, $250 would be 2 $100s and 2 $25s). If you would like your gift to support a specific project or person, please specify the project and/or the person in the notes box of the checkout screen. If the person and/or trip are not specified, your gift will go to support any or all Pathway outreaches. Here are ways to serve here at Pathway. Opportunities to serve outside our community are at the bottom of the page. We are always on the lookout for instrumentalists and vocalists. Must be in High School or older. Contact Tammy Jarboe at tjarboe@cbu.edu. Contact Amanda Carney at acarney@pathwayonline.com. Join the rotation to provide delicious flavor, boost of energy, and a warm smile to the patio on Sunday. More volunteers means fewer caffeineless Sundays. Contact Doug Collins at dcollins@pathwayonline.com. Contact Ed Castro at misterjudo1@aol.com. 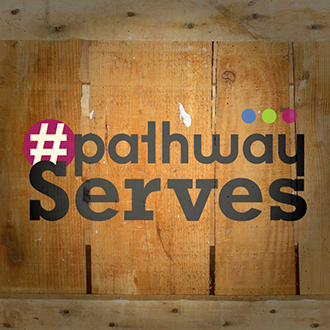 We have many jobs for you to help share God's Word here at Pathway and beyond. Sound, lighting, video, lyrics. We'll train. Be the first smiling face someone sees on Sunday morning. This is a great place to make others feel welcome when they visit Pathway. Contact Scott Mobley at Scott.mobley@asmnet.com. Do you draw, paint, design, take pictures, make movies, or do anything else creative? Want to use it to teach and encourage those at Pathway? We'll find a place for you. Contact Eric Griffin at egriffin@pathwayonline.com. Prayer for Sunday's services 15 minutes before each service. Prayer Room is open each Sunday 8am-12:30pm. Contact Nancy Torgerson at nancysonshine@yahoo.com. Contact Dwayne Ulmer at dwayneulmer@gs.edu. We are going in 2019! It's not too late to sign up! Get your deposit in by the first team meeting on January 20. Details at pathwayonline.com/kentucky. Contact John Kopacz at jkopacz@rdgolf.com. We are planning a trip for September or October (specific dates TBD). If you are interested or want to learn more, contact dvasquez@pathwayonline.com. Contact Denise Vasquez at dvasquez@pathwayonline.com. Need to fill out a form for one of our global outreach trips? Click here. Fill out the form. Then either print it and bring it to Pathway, or save it and email it to office@pathwayonline.com.